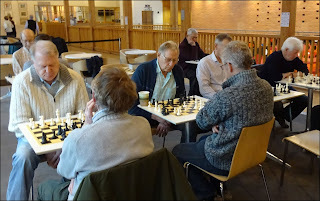 The informal Tuesday afternoon chess club at the Apex in Bury St Edmunds continues to flourish. Today there were 13 'members' attending. In fact, there's no membership requirement; you just turn up at 3.30 pm with nothing to pay (and the nearby car park is free too on Tuesday afternoons). If you're interested and would like to know more, please contact me (Bob).